Smoking meats is one of the great American hobbies, whether its smoked ribs or a juicy brisket. To build the best, Texas-style brisket is not a quick process. There are a number of steps to follow. You can produce a fine brisket worthy of a BBQ restaurant with a few ingredients and an outdoor grill. Let’s guide you through the steps to make this happen. Briskets are the pectoral muscles between a steer’s forelegs. As these animals don’t have collarbones, the load-bearing muscles are quite strong. Because they’re so tough they don’t have much fat marbling. In addition, they feature a good deal of springy connective tissue in and around the muscle fibers. This is what makes brisket the perfect barbecue meat. One of the things many brisket masters now encourage … okay, insist on … is purchasing beef from local farms which promote hormone-free and grass-fed cattle. If you’ve never eaten a grass-fed steak, then you need to do so in order to understand the taste difference between it and what you find at the supermarket. Most likely, organic grocery stores and butcher shops in your area sell natural cuts of meat. While they can cost more, the results are well worth the investment. When you order a brisket, you’ll receive it in a packer. Weighing between 8-16 pounds, the meat comes vacuum-packed in an airtight plastic bag and features two distinct muscles. The flat (pectoralis profundus), is the long, flat, rectangular lean muscle that sometimes comes to a point. The oval-shaped muscle which is narrower, thicker, and fattier is called the point (pectoralis superficialis). The packer may also contain a section known as the fat cap. If your butcher knows their meat, they may trim this before you make your purchase. Should this not be the case, you can trim it off prior to cooking. Regardless who does it, save the fat cap and grind it down to plump up burgers or glaze other meats prior to searing. A brisket’s wet-aged packing date should be between one month and 45 days in its vacuum bag. The longer the brisket is aged the more time enzymes within the muscles tenderize the meat. So, best to look for packages with dates beyond one month. 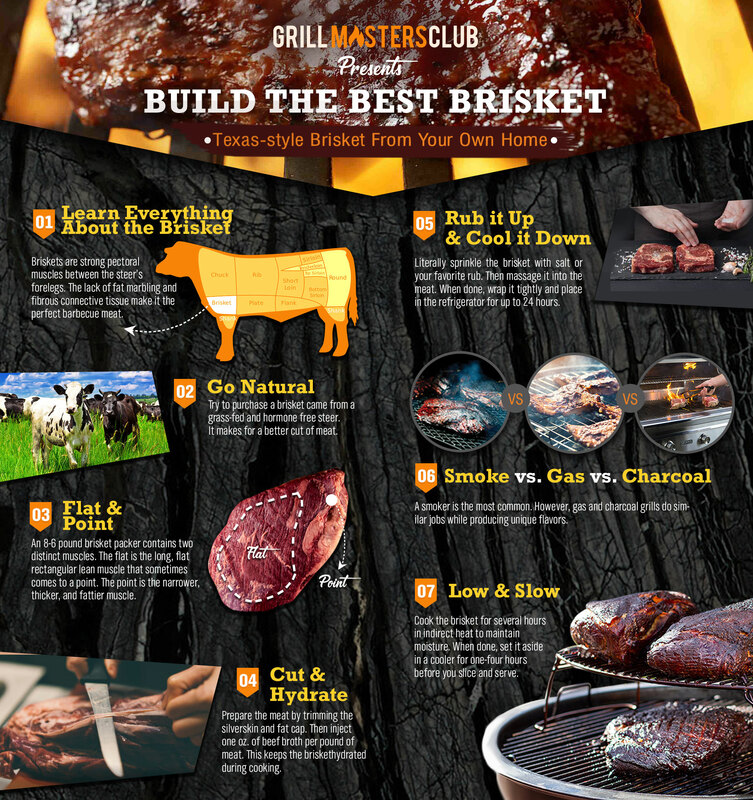 How do you Prepare a Brisket? To prepare a brisket, remove the tough, thin membrane called silverskin from the meaty side. Also trim the fat cap if not previously done. Be warned, first-timers … This is not the point where you slather the meat in a glaze or sauce. You would be tossed out of some parts of Texas – okay, all parts – if you did this. Hydrate your brisket to keep from drying out while cooking. Fill a meat hypodermic with beef broth and inject it into several places around the brisket. About one ounce of broth per pound should do the trick. The sodium-filled beef broth is a multitasker. It keeps the meat hydrated during the long cooking process while it enhances its flavor. The rub also brings out the meat’s natural flavors. Generously sprinkle the rub on the brisket’s exposed pieces. Then, massage it in. When done, cover with parchment paper, butcher paper, or plastic wrap and refrigerate for at least a day before cooking. A simple rub of salt and pepper works best, but this doesn’t mean you can’t use additional seasonings. Nevertheless, multi-ingredient rubs can mask the meat’s natural flavors. It might be best to enjoy the first portion au natural before you start experimenting. How Should I Cook my Brisket? Like skinning a cat, there is more than one way to cook a brisket. While smoking is the most well-known, you can also use a gas or charcoal grill. No matter the means or techniques, the end product is still delicious. Regardless of the method, you need to preheat whatever form of cooker you use. If it’s new, heat it up on a non-brisket day to let the packing chemicals burn off. Furthermore, trial runs are recommended to get an idea of temperature control. The best way to get a handle on cooking temperatures is via the concept of Indirect Cooking, also called a Two-Zone Setup. One side of the cooking surface features radiant heat in the form of gas, charcoal, wood, or all three, as well as a water pan. This produces an indirect heat which is easier to control during the cooking process. Make some practice runs before you cook your brisket. First, never take brisket right from the refrigerator to the cooking surface. Second, have a digital meat thermometer ready so you know when it’s time to implement the Texas Crutch or put the brisket on hold. Don’t worry, we’ll explain later. Overall, cooking brisket is not a 10, 30, or 60-minue process. It takes several hours for this meat to reach the proper temperature and texture. Don’t turn up the heat to cut the time. To cook with a smoker, start with four ounces of wood chips. Heat until the internal temperature reaches 235 degrees Fahrenheit. This is slightly higher than the 225 degrees needed to start cooking to compensate for temperature drop when you open the smoker’s lid. Position the brisket right above the water pan with the meat thermometer next to it. Add another four ounces of wood every 30 minutes for the next two hours. Do not let the water pan dry out. It’s what keeps the temperature from rapidly increasing. After three hours, if the top of the meat is darker than the bottom, flip it over. Do not baste the meat or spray it with water. The water pan and injected broth keep the brisket hydrated. While a smoker is a go-to for cooking brisket, gas grills do an equally fine job. Plus, you can create some unique flavors with the combination of wood smoke and propane. When it comes to the smoker vs. gas grill, the main difference is in your Two Zone Setup. If you have a dual-burner grill, you’ll want to have your brisket on the side where the burner is not turned on. It’s easier if you have a grill with three or more burners. Temperature control is critical, so ensure you have a water pan between the burners and the packer. And use a digital meat thermometer. Don’t rely on the one built into the grill’s cover. It does not accurately measure the temperature in the cooking area. Place the wood chunks or chips close to the flames for a smoky flavor. Replace them every two hours or so. Where the combination of propane and wood creates a unique flavor, so does wood, charcoal, and water. 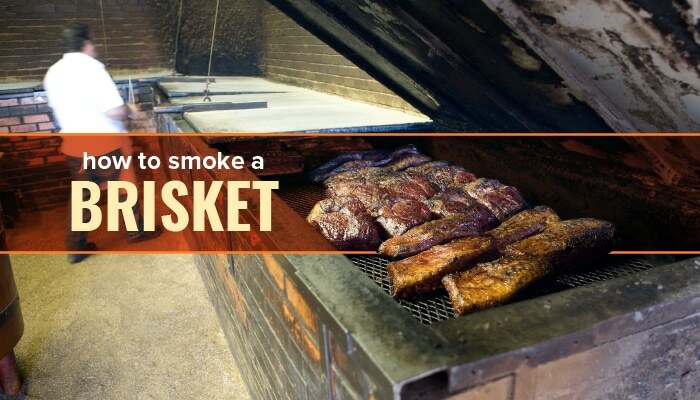 However, the proper combination of all three is needed so the brisket doesn’t taste too smoky or ashy. Another challenge to charcoal cooking is temperature control. Since there are no knobs, control is via oxygen flow and depletion. Open the bottom vents halfway and position the lid’s top vent holes over the location where the brisket will be. Put your digital meat thermometer on a cable and feed it through one of the vent holes. Place the probe in the indirect cooking area. Oxygen controls for the charcoal are from the bottom vents, not the top. There are a few ways to create a Two Zone Setup. One, set the coal and wood chunks/chips on two sides of the kettle with a pan of water in the middle for temperature control. Two, add all the heating elements to one side of the kettle with the remaining space taken up by the water pan. The addition of coals every hour or pouring cold water into the pan maintains the temperature. Don’t let the coals go out so the wood starts to smolder. This leads to a bitter-tasting brisket. The Stall delays cooking time while the Texas Crutch moves it along. The stall occurs when the cooking temperature barely increases at somewhere between the 150 and 170-degree range. Should this happen, execute the Texas Crutch. Tightly double-wrap the brisket in heavy-duty foil then crimp the ends for an airtight seal. Place it back on the smoker to lightly braise and steam the meat while getting you past the stall. When is Your Brisket Done? The brisket is done when its temperature reaches between 195 and 205 degrees. Actually, 203 is the sweet spot. How do you know it’s done? Poke it. If the thermometer easily slides in an out of the meat or it wiggles a bit like your grandma’s gelatin surprise, then it’s done. Before you serve the brisket, you need to put it on a hold. This period of rest prevents the meat from losing all of its liquid and becoming dry very quickly. Grab a cooler big enough to fit the brisket. Line it with an old towel, blanket, or crumpled newspaper. While still in the foil, place the packer, with thermometer still inside, on the lining. Close the cooler’s lid. Let the meat sit anywhere from one to four hours. When is Your Brisket Ready to Slice? Your brisket is ready to slice when it reaches 150 degrees. Although 140 is much better. The minimum time between the brisket’s removal from the heat and serving is one hour. Waiting up to four hours is even better. It allows the rub, juices, and cooking flavors to be completely absorbed by the meat. Don’t slice until all the sauces and sides are ready and the guests are sitting at the table. How do You Cut Your Brisket? The easiest way to cut your brisket is to slice off around one inch from its thick end and two inches from the flat. Locate the fat layer between the point and the flat. Slide your knife between the two muscles which separate them and trim the excess fat. Next, cut across the fat grain to give your guests the option of lean or fatty meat. Cut some extra slices because you know your guests are going to want seconds. And make sure you keep the rest under foil to prevent drying and heat loss. To store your leftover brisket, tightly wrap it in aluminum foil or vacuum seal it and the pan it was served in. Store in the refrigerator for two to three days. Place it in the freezer if using at a later date. To reheat, thaw/warm up the brisket and place it in the oven or a grill of choice until it reaches 140 degrees. This will take longer if using a smoker or other outdoor grill. Now, it’s your turn to make the best brisket. You don’t need to keep looking at How to smoke a brisket articles, practice on other meats then move onto a packer. Be patience & take it slow. Before you know it, you’ll be enticing your guests with tender and flavorful meat worthy of any brisket master. If you want even more help, consider joining the biggest BBQ community on the planet and get the best products and recipes sent to your door.